I am well aware that people can be difficult to please especially when they’re about to part with some hard earned cash. It doesn’t matter if you’re in the market for a new pair of shoes, are having a remodel of some sort done in your home, or (like you are now) looking for a new kitchen faucet, quality and value for money is something we all look for. Some faucets for the kitchen can cost a “pretty penny” so you need to make sure you get the very best not just with the overall design, but durability as well. 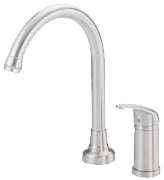 After all, changing this appliance in your kitchen isn’t something you’re likely to do too many times and that’s why I have included the Grohe 32 298 SD0 kitchen faucet in my selection of reviews (better known as the Ladylux3). I firmly believe the manufacturer has got it right when it comes to durability with this model, but then I’m not here to tell you what you should or shouldn’t buy. If you are interested in finding out more about this model of faucet, I’ve included some of the more important points you should consider before finally making a purchase. In my experience (and I could be wrong), what many customers first look for when they’re in the market for a new kitchen faucet is looks. It might seem a little silly but making sure this “tool” in your kitchen fits with the overall theme can actually add a certain something to the finished look. The manufacturer has managed to combine the practical with style, and the end result is a faucet that has clean curves with an overall ergonomic design making it easy to use. Grohe has named this the “café” style faucet and you soon understand why when you first take a look at it. They have also thought about color choice as well, and you will find this model in a variety of different shades including black, StarLight chrome, SuperSteel and of course the trademark RealSteel Stainless Steel. You can even choose a mixture of RealSteel Stainless Steel with black. You get both spray and normal flow options with this kitchen faucet which has a unique trigger type control. This means you can switch from normal flow to spray with just the flick of a button. Grohe has also used their own SilkMove technology with the lever so you get precise control over the water flow as well as temperature (for the more technically minded people out there, you can get 2.5 GPM with this model). You may find this with a lot of other models of kitchen faucet but the spout will swivel a full 360 degrees making it really versatile. However, what you might not find with other models is the SpeedClean system. Lots of faucets break down simply because they become totally clogged up with unwanted lime-scale build up. With this model, you won’t have that problem because the anti-scale system stops this build up from happening. Finally (and I’ve left the best until last) the construction of this faucet is one of the strongest I’ve come across. It’s made from grade 304 stainless steel which is one of the most durable on the market, so if you decide to purchase one of these you won’t be replacing it again anytime soon. One very small point I would like to make however is that some people have commented the spray wand with this faucet is a little too solid. It’s easily flexible enough so you can use it to fill pots or pans away from the sink, but it can be a little awkward when you retract it back into the spout. Because it’s so heavy duty, you might find this model a bit “overkill” with smaller sinks, in which case my review on the Delta 9159-AR-DST may be more to your liking. 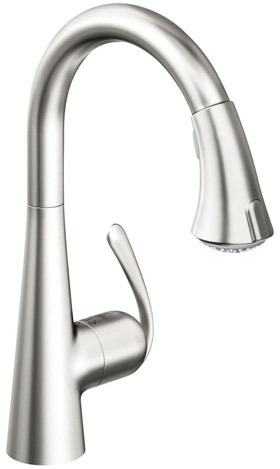 If would like to find out more about this Grohe kitchen faucet just take a look at Amazon. Be quick though because the last time I looked, there were only 14 left in stock!